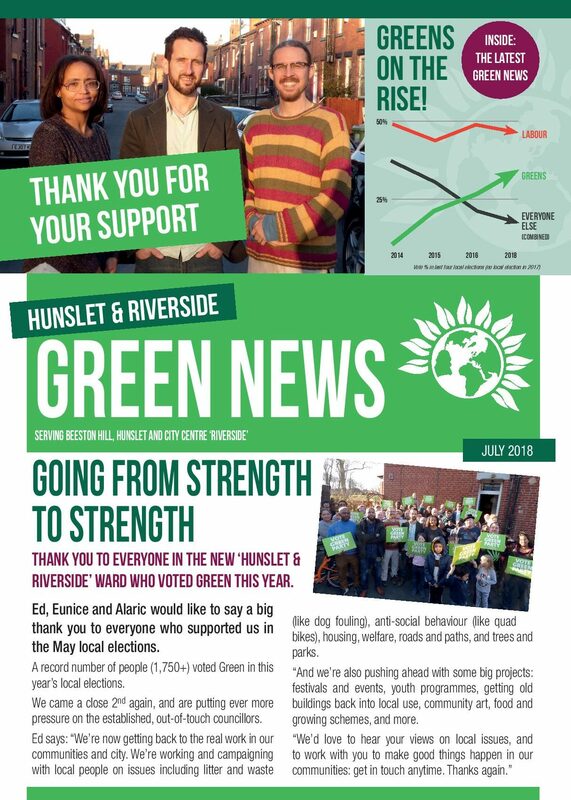 We’ve kept up a steady flow of community newsletters across the ‘Hunslet and Riverside’ (formerly ‘City and Hunslet’) communities year-round since early 2015 – not just election time. Along with door-knocking and street stalls, we do all this to make ourselves as available to the community, year-round, as possible. A growing number of people are approaching us for support with stuff, and we’re helping even more good stuff to happen. We’re here to help! The leaflets are all downloadable below, and give a good sense of who we are and what we’re about. Please have a read, and come back to us about anything. Or come meet us sometime: click here. 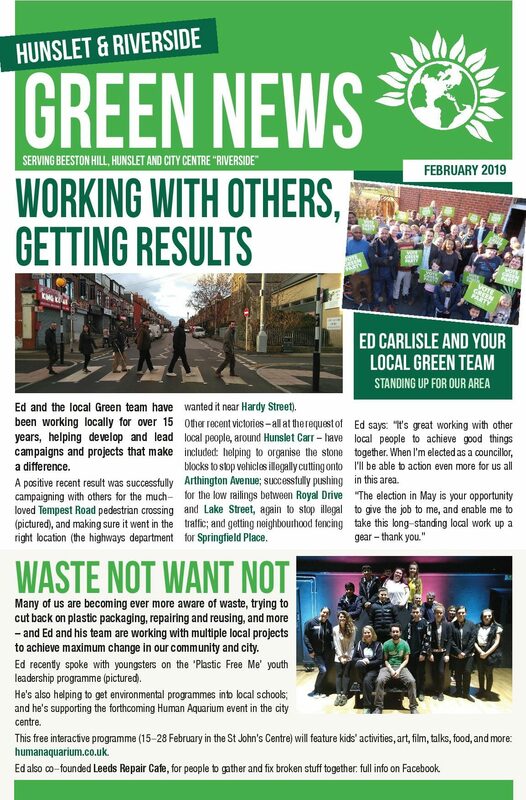 Click here for leaflet 18 (VOTE ED CARLISLE), April 2019. Click here for leaflet 17 (WORKING WITH OTHERS), February 2019. 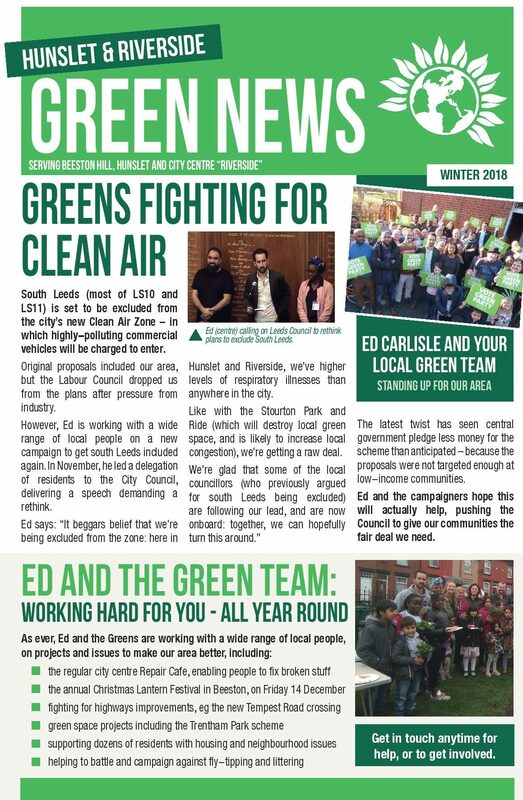 Click here for leaflet 16 (FIGHTING FOR CLEAN AIR), November 2018. Click here for leaflet 15 (THANK YOU), June 2018. Click here for leaflet 14 (LEEDS LOCAL ELECTIONS 2018), April 2018. Click here for leaflet 13 (FED UP WITH FLYTIPPING), Mar 2018. Click here for leaflet 12 (LIVING HERE, WORKING FOR YOU), Jan-Feb 2018. Click here for leaflet 11 (LET’S SAVE THE WORLD), Oct-Dec 2017. Click here for leaflet 10 (FIGHTING FOR), May-June 2017 – for the General Election. Click here for leaflet 9 (FRESH IDEAS, WORKING TOGETHER), May 2017 – for the General Election. Click here for leaflet 8 (HAPPY NEW YEAR? ), January 2017. Click here for leaflet 7 (THANKS AGAIN), summer 2016. Click here to download leaflet 6 (PLEASE VOTE), April 2016. Click here to download leaflet 5 (HELLO AGAIN), March 2016. Click here to download leaflet 4 (HAPPY NEW YEAR), January 2016. Click here to download leaflet 3 (THANK YOU), summer 2015. Click here to download leaflet 2 (LOVE LEEDS), April 2015. Click here to download leaflet 1 (HELLO), February 2015.